Mary E. Hutchinson’s “Cat” Sold at Auction! I’ve just learned that Mary E. Hutchinson’s ca. 1934-35 painting “Cat” was recently sold at auction. Hutchinson exhibited the painting at the Washington Square Sidewalk Show probably in 1934 and then again at the Argent Galleries in New York in 1935. The Argent Galleries was associated with the National Association of Women Artists. 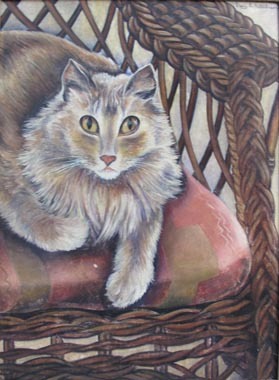 “Cat” is currently featured on my digital archiving site, Artworks of Mary E. Hutchinson at http://meh.omeka.net. You are currently reading Mary E. Hutchinson’s “Cat” Sold at Auction! at Jae Turner.